Welcome to my new and improved website! My name is Karsten Ewald and I operate a home-based pottery studio called Karsten's Klaywerks. I am a potter living in Columbia, Missouri, on the northern edge of the Ozarks and deep in the heart of the American Midwest. I specialize in producing heirloom-quality utilitarian stoneware pottery, but I also enjoy creating one-of-a-kind ceramic pieces for galleries, collectors, and home decorators. Tableware sets, corporate gift commissions, and wholesale orders are welcomed too. 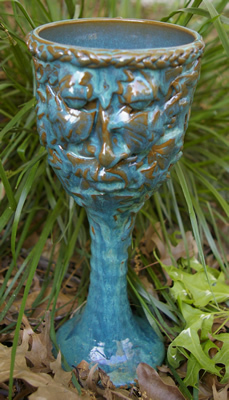 I have formulated my own stoneware clay body with attractive, lead-free, durable glazes to fit. My functional ware is vigorously tested to be dishwasher and microwave safe. This website is a work in progress and eventually will have shopping cart capability. My gallery pages will be updated often with new work and my calendar will keep you informed of my upcoming shows. All pottery shown is for sale unless otherwise noted. My pottery will make your life better!